Founded in 1992 as a non-profit association. The school is situated in on the outskirts of the city and com- prises four stages: Pre-school, primary school, secondary school I and II. There are more than 530 students from 230 families. An educational institution founded on God the Father and following Fr Joseph Kentenich‘s pedagogical teachings. 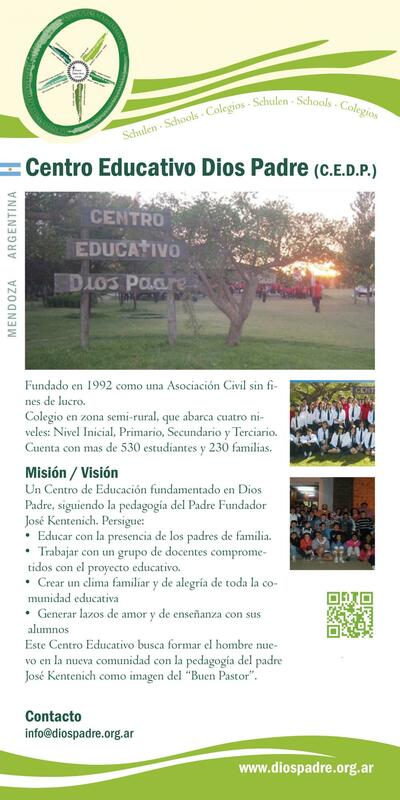 It has taken on the task: • To involve the parents in the educational process • To work with teachers that are committed to this educational project • To create a family-like and joyful climate in the entire educa- tional community • To build up attachments through which the students are given knowledge and affection.